This is the secret ingredient of restaurant food. 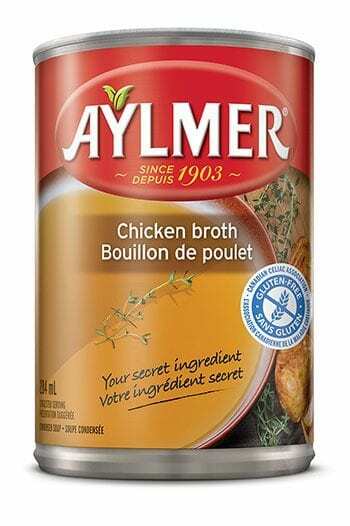 A good chicken stock has the full clean flavours of chicken with aromatic vegetables and a consistency that enhances rather than competes with your home chef sauces, glazes and soup-based recipes. It is an excellent way to increase flavour and body. Bring a large saucepan of salted water to the boil. Add the sweet potatoes to the boiling water and cook for 2 minutes. Add the gnocchi and cook for about 2 minutes or until they come up to the surface. Drain off the water and set aside. In a non-stick pan, brown the meat from the sausages in olive oil breaking it up with wooden spoon. Add the green onions and cook for 1 minute then set aside. In a pan melt the butter on medium-high heat. Add the flour and continue to cook for 1 minute. 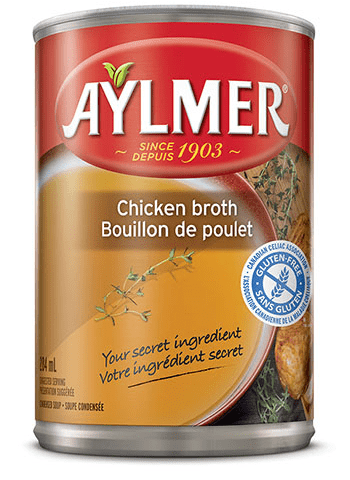 Add the Aylmer Chicken Broth and bring to a boil while whisking continuously. Add the cheese, sun-dried tomato pesto, gnocchi mix and sausage meat mix and reheat on low heat for 10 minutes. Add parsley and pepper. Serve. In a large saucepan, heat the oil, add the chicken, peppers and onions until the chicken is cooked. Add the Aylmer Chicken Broth, curry paste, coconut milk, lemongrass and coriander. Bring to a boil and turn the heat to low. Cover and allow to simmer for 5 minutes. Serve with rice vermicelli noodles.